1973 Philips (International Series) Records original pressing, made in England. 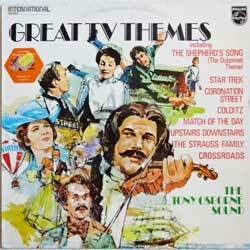 Tracks (16): Theme from STAR TREK, The Shepherd's Song (from the DUBONNET TV Commercial), Theme from CORONATION STREET, The Girl With The Sun In Her Hair (from the SUNSILK TV Commercial), Theme from CROSSROADS, Morning (from the NESCAFE Commercial), Match Of The Day, Theme from COLDITZ, Theme from THE STRAUSS FAMILY, Hawaii 5-0, I Can't Let Maggie Go (from the NIMBLE TV Commercial), Air On The 'G' String (from the HAMLET TV Commercial), I'd Like To Teach The World To Sing (from the COCA-COLA Commercial), Greensleeves (from the ALKA SELTZA Commercial), The Edwardians (from UPSTAIRS AND DOWNSTAIRS), Love Theme From SPARTACUS (from THE ONEDIN LINE). Состояние винил очень хорошее+, конверт (ламинированный) отличное.